While digging through old newspapers looking for material for this site, I occasionally happen across an article that isn’t substantial enough to warrant its own separate entry here. I call these articles my “odd and ends,” and I even included a chapter with that title in Haunted Marion, Ohio. What follows are a couple of odds and ends that I’ve collected since the publication of the book. I actually tried to find out if there was a trial involving a man named Brown and the murder of an editor from Dayton before 1869 but was unsuccessful. Could this be a very old example of an urban legend? An apparition of the devil is reported from Mt. Olivet Church, Marion, Ohio. The visitant, when seen, is always at a window looking out. Color in the daytime: a sickly green. Color at night: a lurid red. One would think that a story like this would’ve gotten some press in Marion. However, neither of Marion’s two newspapers, The Marion Daily Mirror or The Marion Daily Star, mentioned the devil or, for that matter, even a Mt. Olivet Church in 1902. How the editors of the Republican ended up with the story is a mystery. A far more plausible story ran in The Marion Star on July 30th, 1937, detailing the “antics” of the Marion courthouse clock. Recent antics of the ancient courthouse clock are becoming a serious mystery to Sherman Dixon, for the last 36 years one of the building custodians and probably the oldest county employee in point of service. The massive timepiece, by far the largest in the city, several times this year has stopped during the night and then started up again – which simply isn’t possible for it to do all by itself, Mt. Dixon says. To anyone who isn’t a bird, the clock is virtually inaccessible and there are only three sets of keys to the door which leads into the attic. All are held by the janitors and other county officials who are not suspected of complicity in the mischief. John Haines, Stationary engineer, is similarly puzzled. 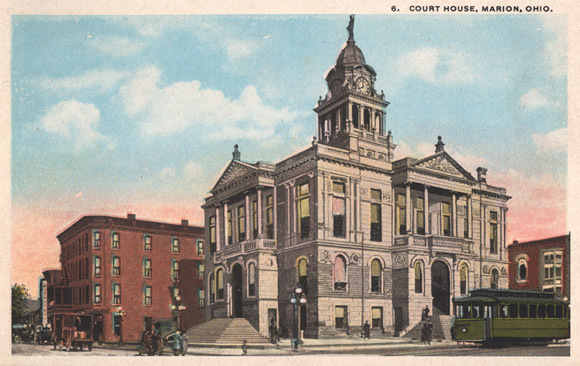 This postcard, courtesy of Marion resident Mike Crane, shows the Marion Courthouse (and its misbehaving clock), circa 1920. Anyone interested in looking at Mike’s nice collection of old photos, postcards and other assorted Marion miscellanea should check out his website. The article doesn’t imply that the clock’s behavior was the work of supernatural forces. On the contrary, Mr. Dixon suspected “miscreants” of messing with the clock, though he wasn’t able to adequately explain how they could’ve carried out such mischief. Anyone interested in seeing the original article can download the PDF file here. On November 2nd, 1904, this article concerning Marion County appeared in The Hartford Herald, a newspaper serving the tiny town of Hartford, Kentucky. Haunted through life by the terrible impressions made upon him at the hour of his birth, George Yeager of Richmond [sic] Township, has been driven insane and was to-day sent to the State Hospital. On the day he was born a terrible thunderstorm was raging, and about the hour he was born a bolt of lighting struck near the home of his parents, frightening his mother almost to the point of unconsciousness. Then, too, while Life was bringing him into the world, Death had laid claim to his father This, added to the other harrowing experiences, so unnerved the mother that she has never been well mentally as she was before. That these vivid impressions upon Mrs. Yeager communicated themselves to the sub consciousness of her child, are evidenced by the fact that he has…had an unnatural fear of thunderstorms and death in any form. The finale of this strange life tragedy came to-day with the commitment of the man to the asylum. Despite mistakenly referring to Richland Township as Richmond Township, the basic story seems at least plausible. And of course, Mautz-Yeager Road, which is presumably named after the Yeager family, runs through Richland Township, and this detail lends the article a certain amount of credibility. In another bizarre report, Dr. T.B. Fisher of Marion, Ohio, described the case of a lady who had felt something moving in her stomach for four months. She was ridiculed by her friends as a hysteric, but she silenced them by vomiting a nearly fully grown mouse, which Dr. Fisher kept in a glass jar in his office as a pet. There’s no question that Dr. Fisher was indeed a member of the Marion community. According to the 1907 History of Marion County, Dr. Fisher opened his practice in 1835 and faithfully served the people of Marion until he retired in 1882. He also served two terms as Marion’s mayor. Why such a well-regarded figure would tell such an outlandish story is uncertain.